Office Web Applications is a sister product to SharePoint that enables you to view and edit documents in the browser. Office Web Applications is installed separately from SharePoint, and then configured to provide the in-browser document capability to SharePoint. Office Web Applications is available with Office 365 and is already configured to work with SharePoint Online (because Microsoft engineers did this for you). If Office Web Applications is installed and properly activated in your team site, Microsoft Office documents such Word and PowerPoint files open in the browser. The experience happens automatically, so you just have to click the filename in the app to open the file. Office Web Applications is especially useful when you don’t want to install the Office 2013 client on the desktop. It also makes quickly browsing document contents a breeze because the file opens right in the browser. Office Web Applications is also available in the consumer version of SkyDrive. 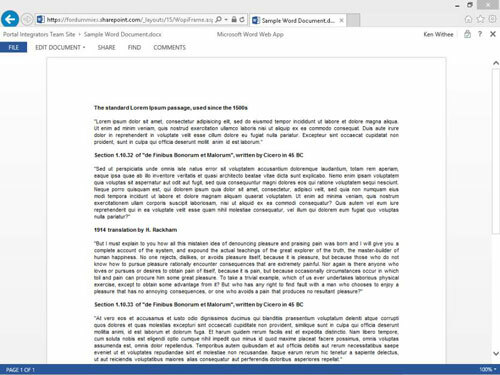 Using SkyDrive, you can open your Office documents right in the browser. And the consumer version is free!